Most people think marketing is the same thing as advertising. To me, it has always been about helping the buyer on their journey through customer-focused communication. Now social media networks and mobile internet access are making content the hot new thing in marketing. Content our customers want. Content our customers can consume whenever and wherever they want. This was my prediction about the future of marketing. That the truly “social business” will use all of its employee resources to communicate with buyers, customers, partners and potential future employees. And marketing can play the leading role in helping us make this transition. But I was curious to hear what some of the greatest minds in marketing and social media saw as they considered the future of marketing. This is their story . . . Over the course of 4 months, I interviewed 23 marketing leaders and created the “future of marketing” series. The articles generated a ton of interest, insightful comments, new readers and helped me make a few new friends. Now, the amazing team at Velocity Partners have designed this ebook to help you get to know these marketing leaders and to get at the heart of what the interviews revealed. It’s a hugely exciting time to be a B2B marketer and the expert interviews show just how fast moving, diverse and downright interesting this whole thing is. If you haven’t already, read the full interviews – they’re well worth your time. Finally, I want to give a massive thank you to Velocity Partners and all the experts in the series. It was more than a pleasure talking with you – it was an education. So check out the ebook. 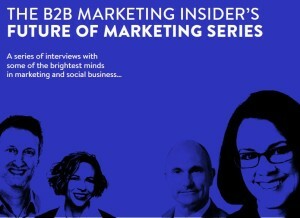 Read the interviews and tell me what you think the future of marketing will bring? Thanks Kenny. you know I’m not doing this for the money. Just trying to get the word out! Appreciate the support. Nicely done Michael! I love a good Slideshare preso. Sharing now….. Thanks Jason! for the comment and the sharing. Thanks Mark. Velocity gets all the credit for the design and you folks provided all the insight! Thanks Margaret, was a last minute change to get your new role in there. Happy to have made it work. Honored you participated. Congrats again on the new role. This is a measured approach, sensibly distanced from some of the more fervent ramblings of marketers. But I see a yawning gap opening up between the vision and the reality. “Establishing a connection, building trust and credibility and maintaining a relationship over time” is surely totally incompatible with leads being tossed between marketing and sales like meat to hungry wolves. Hi Peter, I think change requires vision to be out in front of the current reality, almost by definition. These leaders are looking into the future and defining what marketing will look like and how we need to get there. Those who don’t start working to where our customers are going to be will be left behind. Great re-imagining job Michael, thanks for including me! Thanks Todd. Congrats for making the front cover. You have Doug to thank for that! Like the first commenter mentioned it was refreshing not to see a lead gen form first. Good e-book too with lots of thought provoking snippets that I can’t argue with really. I also agree that this is the year that businesses will start to harness employees social networks to expand their online reach (if they’re not already doing so).. Thanks Robert, I never even considered a form. I was honored that all these folks shared their thoughts. And it was my pleasure to share them with the broadest possible audience.